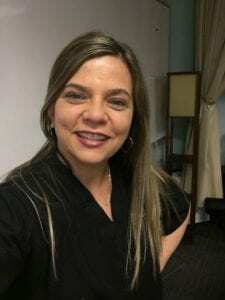 “Work” is not a word Eliane Oramas would use to describe her job as a massage instructor at Florida Academy. For her, teaching massage therapy program is her passion. A beauty school graduate who went back to study massage therapy at the age of 30, Oramas says it changed her life. “I never felt that I went to work again because I found the passion in what I like to do,” she says. She began teaching in 2005, but she has also done massages in spas and a chiropractor’s office. In addition to teaching at Florida Academy, she also recruits for a massage-on-demand company, which operates along the lines of Uber. Besides learning the techniques used in Swedish massage, students need to know how to effectively communicate with clients. Millennials have been brought up with technology; social media often substitutes for actual one-on-one communication. “Massage is a customer service-oriented field,” she explains. “You want to make a difference to where that client is going to want to come back to you. You want to stand out.” To do that, massage therapists need to discuss treatment goals with their clients. What do you want to get out of the massage? Do you have areas of tension? Do you have an injury? Are you going through an emotional phase of your life? Do you just want to relax? By triggering an involuntary – but expected – relaxation response from the nervous system, massage can produce physical and emotional benefits. This causes your heart and breathing rates to slow down, and your blood pressure and stress hormones to decrease. Certain chemicals are released that make the body feel good. “Your cells have memories that they want to come back,” Oramas says. “No healing takes place unless the person is relaxed.” That’s why massage therapy, which promotes the immune system and assists healing, is used in healthcare facilities. That opens additional doors to graduates. Rather than work in a day spa or massage franchise, they can put their skills to use working with chiropractors, oncologists, sports medicine doctors, prenatal wards, hospice and more. “If students have an interest in healthcare, [massage therapy] is definitely a gate, an entry into it,” Oramas says, “because it gives you a good amount of knowledge in terms of the body.” Students learn anatomy, physiology and medical terminology as part of their massage training. “You can make enough money in massage therapy to pay your way through physical therapy school or whatever interest the student may develop,” she continues. If Eliane Oramas inspires you to promote wellness and help people relieve their pain, consider a career as a massage therapist. Florida Academy in Fort Myers offers a comprehensive curriculum (with the flexibility of day and evening classes) that can get you started in a massage therapy career in as few as 30 weeks. When you conclude your training and earn your license, you will be qualified for a massage therapist position in a clinic, chiropractic office, spa, hotel, fitness center, sports medicine facility, cancer treatment location or more. Contact Florida Academy today. Classes begin every six weeks.